Leon ANAVI may be a full-time software engineer, but in his spare time he has started to develop open source hardware project with the help of others and by himself. Last year, I got hold of his RabbitMax Flex HAT for Raspberry Pi, and tested it with the provided LCD display, one temperature sensor, and a Raspberry Pi 2 board. 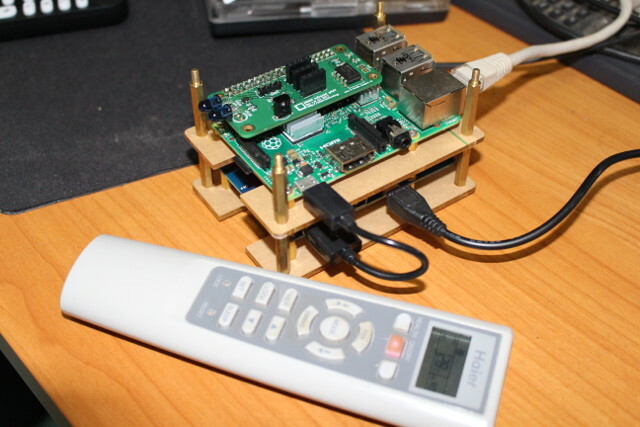 The board also featured IR receiver & transmitter, and I tried to use it with my aircon remote control, but at the time I did not find a way to do it easily, and control my TV with LIRC instead. 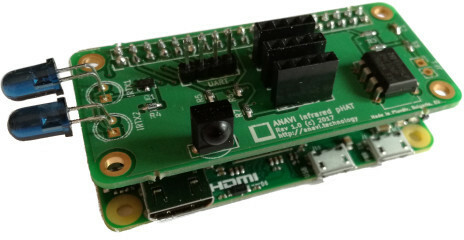 Leon has now made a simpler, smaller, and cheaper add-on board for Raspberry Pi Zero, and other Raspberry Pi boards with a 40-pin header, with 3x I2C headers, two IR transmitters, and one IR receiver. 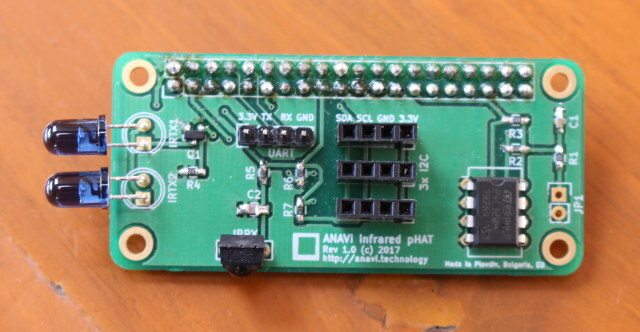 He sent me a sample of “ANAVI Infrared pHAT”, and after quickly describing the board, I’ll show how to I could control my air conditioner with a Raspberry Pi 2 board and his Infrared pHAT. The top of the has the 3x I2C header for 3.3V sensors, a UART header to access to serial console, two x 5mm IR transmitters (IR LEDs), and one IR receiver (IR photo sensor). It also has an EEPROM to store the HAT ID. The other side comes with the 40-pin female header to connect to your Raspberry Pi board. The board was designed with KiCAD, and the hardware design files are released under a “Creative Commons Attribution-Share Alike 3.0 United States” License on github. 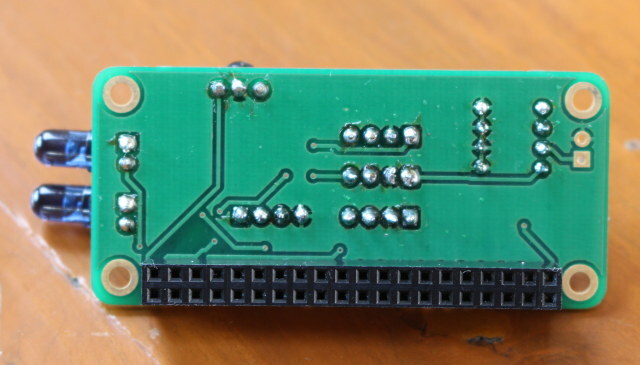 There’s only one step: insert the board on the 40-pin connector of your RPi board. You can only make one mistake, inserting it the wrong way. It has to be connected in away that it covers part of the board. I’ve connect it with a Raspberry Pi 2 board with a battery kit, but it fits even better on the Raspberry Pi Zero, or newly released Raspberry Pi Zero W.
It’s time to start software setup in order to control the Haier air conditioner pictured below. You’ll need to install Raspbian, and some packages including LIRC, but I’ve already explained how to do that in RabbitMax Flex Getting Started Guide, so I’m not going to repeat those steps here, especially you can find them in ANAVI Infrared pHAT user’s manual too, and I’ll assume you have already setup your board. The reason why I could record IR commands from my TV remote control, and not my aircon remote control last time around, is because aircon remotes send not only one byte but also status info each time. The trick is to use mode2’s “alternative display mode” to capture pulse/space data as raw config files. Wow, that’s a whole bunch of numbers, but that’s exactly what we need as those are the duration of the high and low levels of the IR signal. I have repeated the same command, but capturing 4 keys: off, on, up to 29C, and down to 28C. And the later happened, which means you need to record all temperatures you want to set, and there’s no such thing as UP and DOWN keys. While the instructions above will work with any board with IR receiver (for first time setup) and IR transmitter, you may be interested in getting ANAVI Infrared pHAT on Indiegogo for $9 plus shipping ($5 to $7). There are also other rewards including the pHAT, I2C sensors, and debug tools. The campaign has already surpassed its funding target ($500), and delivery is planned for September 2017. Way to go overboard. The same can be done with an ESP8266 and an IR led. You dont even need a resistor since ESPs are 3.3V. I’ve put such a setup inside a radio once and simply pointed at the IR receiver from behind. Maybe you could add some boards to your compatiblity list? @tkaiser I haven’t tried out the Infrared pHAT with Orange Pi yet. My focus for this project is Raspberry Pi. Btw the majority of the Allwinner development boards that I have are open source hardware from Olimex but their pin out is not compatible with Raspberry Pi. Speaking about Sunxi mainline kernel, recently I read the specifications of NextThingCo about making DIPs for C.H.I.P. The procedure for flashing a device tree fragment in an EEPROM seems very similar to HAT/pHAT for Raspberry Pi. Great article indeed! It’s very helpful and it was very easy to follow the instructions. How to know the gap? I have just used the default value, and did not look too much into it. gap A (typically long) space which follows the trailing pulse. Do you have troubles with the gap? cnxsoft thanks gor the reply. I have lirc on my rpi3 works flawlessly on my home theater. But cant get it working with my aircon. I got the raw data as above but don’t know what to put in gap value. Any help be appreciated. Thanks. So I assume you’ve already tried with the default gap, but it does not work. Just to make sure… did you delete the first large value from the raw data? It looks OK. Sorry, I don’t know what the problem may be in your case. If you have an oscilloscope or logic analyzer, you should be able to study the signal to find out what is wrong. I try to get high brightness emitters, Mmybe that will help. Also, I get different codes every time I click power button. Is it because of time? The values represent the long and short pulses of the IR signals, so there could be some small variance each time. If the numbers are much different, then it should mean that some value – like time – inside the remote is changing each time. 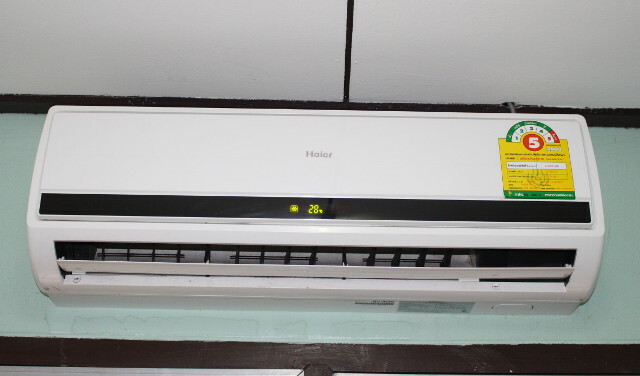 I managed to get my Midea AC running with the same principle and with the Anavi PiHat. Thank you very much for sharing this guide, very nice and clear tutorial. I got finally my panasonic air cooler working.